In her 20s, Emily Watson was on top of the world: she had a best-selling novel, a husband plucked from the pages of of GQ, and a one-way ticket to happily ever after. 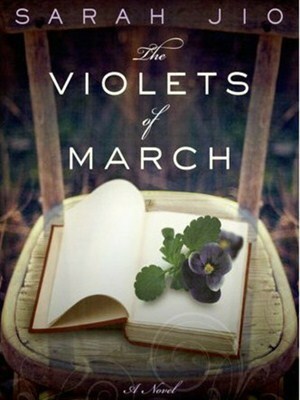 I thoroughly enjoyed listening to this audiobook - The Violets of March, the debut novel of Sarah Jio. Set in the contemporary world it reaches back to the past via the diary by Esther that Emily finds and reads over a number of days in March. How did the diary happen to be in the bedroom that Emily stays in while with Aunt Bee? Well someone has placed it there for her to read, but it is a mystery until the very end as who it might be. I loved Aunt Bee and Evelyn her friend. The way the narrator used her voice for them just made this book so much more enjoyable for me and in the end once I started listening to it, I had completed it in a few days. As well there are other older identities still living in Bainbridge who were alive during the 1940's where this story began. Emily has never been able to replicate her successful novel and has never really written since. Her marriage has been shattered by infidelity - a theme running through this book, so if it gets you hot under the collar, its better most likely not to read it. In Bainbridge she meets Jack, the grandson of Elliot who loved Esther long ago. It is Jack that attracts Emily and their relationship plays out in the book. As Emily reads the journal, and stays with her Aunt Bee she has time to heal and see life differently. In fact she will never be the same again as slowly people and the mysteries of the past start to clarify and she tracks the story to the end. Right up until it is time for a new story and a new beginning. I loved the older characters, the setting and the mystery. I thought the narrator was well suited to the book and it is her interpretation that added to my enjoyment. I'm really glad to see you enjoyed this book. I've had it on my Kindle for a long time and just recently became a fan of Sarah Jio. I've read three of her other books this year, but haven't gotten to this one, yet. I need to make time to read it soon! I only became a fan of her books this year too. What the blogging world does - points you in the direction of good authors! So difficult to make time though for all the books available. Yes I have read Goodnight June and loved it. Think it was the first I read of hers. Some readers went on about this was her first and not as good as ones that followed, but I think the audio helped me to really enjoy it. I must make time to read some more of hers. Yes, think this is only the 2nd or maybe the 3rd that I have read of hers, so I have a good few to read. Which is always good! Sarah quickly became a favorite author after reading this book. Glad you enjoyed it. Glad you enjoyed this Kathryn. I have The Look of Love by Jio on my Kindle that I am looking forward to reading. Yes Pat I see others enjoying The Look of Love so no doubt I will pick it up in 2015. I've had this on my TBR shelf for too long! I love Jio's writing, so I just need to make the time to read it.